The impressive, futuristic landscape of the City of Arts and Science covers a vast area, rising out of a man-made lake in what was formerly the bed of the River Turia, and encompasses various attractions, accessed along a magnificent arched walkway overhung with an array of flowering aromatic plants and shrubs. The city consists of five areas: the Hemisferic, containing the IMAX cinema and other digital projections; the Umbracle, a landscaped viewing and parking area; the Principe Felipe Science Museum, dedicated to interactive science; the Oceanografico, the largest aquarium in Europe, housing more than 500 marine species; and the Palau de lest Arts Reina Sofia, which hosts opera, theatre and music performances. The cost of exploring the whole 'city' is considerable but well worth the expense; the exhibitions and various features are stimulating, educational and entertaining and the beautiful, otherworldly architecture makes you feel as though you are in a sci-fi movie. 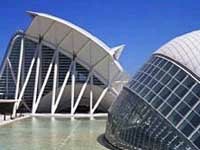 It is Valencia's most celebrated modern tourist attraction and a must-see for visitors. The city requires a whole day of your attention if you want to experience everything, and there are some great restaurants for refueling and resting in between attractions. Even if you don't enter a single building strolling around and admiring the exteriors is very rewarding. Admission: Combined tickets for the all areas cost €36,25 (adults) and €27,55 (reduced), entry to specific areas can be paid individually. Check website for details.